When using amino acids as an addition to our treatment for fibromyalgia, the first question might be.. exactly what are amino acids? And, secondly, why are they important to us when living smarter with fibromyalgia? Amino acids are the building blocks of proteins and although hundreds of them exist in nature, only about two dozen of them are important to human health. They are listed as essential and non essential compounds, however for the purpose of treating any illness, it is more about what each one can do individually to produce a favorable outcome ..
Did you know that using various amino acids can have a positive effect on symptoms within fibromyalgia? In any treatment for fibromyalgia, amino acid therapy is too often overlooked as an important addition. And yet, it has been used successfully by naturopath doctors for years who have treated various illness including fibromyalgia and its related conditions such as (CFS) Chronic Fatigue Syndrome. Not as a cure but for creating a stronger foundation. It is part of the protocol that I use with myself and with clients. From treating sleep disorders and energy deficits to nervous system and methylation factors that support proper neutralizing and elimination of toxins within the body. Certain amino acids can have positive effects on liver and cardiovascular health. Even treating Post Exercise Malaise with certain amino acids has shown to be very beneficial. Yes, utilizing various amino acids can be a great adjunct therapy to any wellness plan and/or treatment for fibromyalgia. Remember to get doctors consent and individual dosing, as these are general recommendations. The list of individual amino acids (bottom of this article) can also apply to other conditions as well .. The allergen free protein powder (Original Plantfusion) that I use and recommend is a great example of a protein source that includes an amazing amino acid profile. Original Plantfusion (available in various flavors and unflavored) makes it easy to obtain many of these amino acids in ONE source as well as getting the safest form of protein. It's perfect as one nutritional element in the total treatment for fibromyalgia. Shown here is the side label of the amino acid profile in Original Plantfusion. Click here, nutrition tips for more information on Original Plantfusion. A common question regarding amino acids is "can we get them in our food ?" Yes, and although amino acids are abundant in foods like animal proteins and certain combinations of foods, they are not utilized 'therapeutically' in the same way as when we take them in capsule or powder form. As in the Plantfusion protein powder shown above OR in the variety of single amino's listed below ..
We can better control which amino acid and how much when taking in supplement form. Great benefit can be derived when we get the right therapeutic dose for our specific malady .. that is why we refer to this concept as 'amino acid therapies'.. Although there are many amino acids, I am condensing the list to what I have found to be some of the more effective amino acids and their benefits when using as a treatment for fibromyalgia. We must all prioritize. 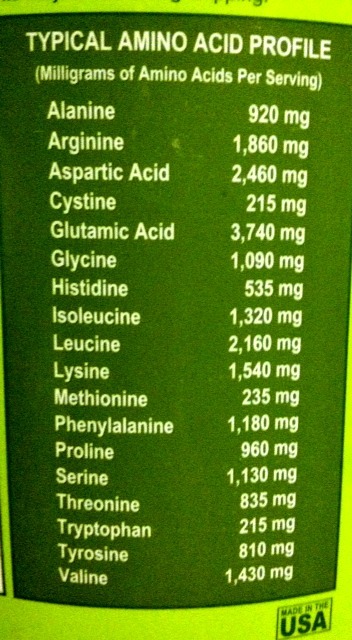 Some amino acids may be sufficient in our protein powder or supplement we are already utilizing. However, some of these when taken individually, will be more effective. For instance, L-Theanine is found to be very effective to calm the body for sleep. I take this amino acid seperately at night about an hour before bed. 1) L-Glutamine: An essential for healing leaky gut, nourishing muscle and reducing lactic acid that increases during exertion and exercise. Stress reduces our stores of glutamine. And yet the immune system requires large amounts of glutamine. Glutamine is fuel that the body needs to stay healthy and naturally increase HGH (human growth hormone) which is responsible for healthy aging, sleep and metabolism. 2) Taurine: Supports the nervous and cardiovascular system by regulating heart rhythm, contraction and blood pressure. Increases the body’s ability to utilize insulin which improves glucose tolerance. Essential for mineral balance. Supports healthy cholesterol while supporting the liver in detoxifing various toxins. Studies (Life Extension) have shown that Taurine has been helpful in reducing the severity of NAFL, or non-alcoholic fatty liver disease. 3) N-Acetyl-L-Cysteine: A powerful antioxidant and precursor to glutathione which helps to detoxify and strengthen the immune system. Essential for the nervous and immune system. NAC is important when the body is exposed to radiation from various sources in our environment today. 4) L-Methionine: An amino acid containing sulfur and important to the body’s natural methylation processes. 5) Acetyl-L-Carnitine: Helps to promote cellular energy while easily crossing the blood-brain barrier to reduce oxidative stress. Supports healthy brain function by stimulating the release of acetylcholine and dopamine, both essential neurotransmitters in brain health and communication. 6) L-Arginine: An antioxidant amino acid that supports the production of nitric oxide. This is essential to healthy blood vessels and blood flow. 7) L-Tyrosine: A non essential amino acid used by the thyroid gland to produce thyroid hormone. Can regulate mood and cognitive function. Please note however that tyrosine is not right for everyone and some with adrenal over stimulation may find that tyrosine works against them. Tyrosine is found in many over the counter thyroid supplements so please use caution if any side effects including nervous energy or increase in heart rate or palpitations do occur. 8) L-Arginine: Also a precursor to nitric oxide and used in cardiovascular health, healthy blood pressure and mitochondria support. 9) L-Ornithine: This amino acid is needed in the metabolism of arginine. (Often in a ratio of 2:1) Helps the body to relax and promote rest. 10) L-Theanine: Excellent for promoting relaxation. Naturally occurring in green tea and often found in supplements to promote rest. These three amino acids are often used before exercise to support protein synthesis, metabolism and overall physical fitness. 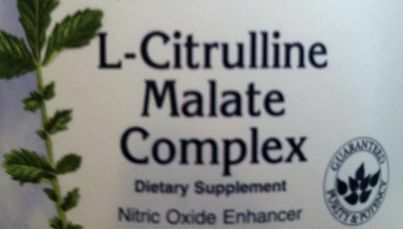 12) L-Citrulline Malate: A unique and lesser known amino acid, Citrulline is isolated from watermelon. A key component in the urea cycle, the process that eliminates metabolic waste products. Malic acid combines well due to it's ability to produce ATP (adenosine triphosphate) a primary energy source. Shown below is a cost effective L-Citrulline powder from Swanson Health Products.. This is an overview of how amino acids can support a wellness plan when addressing the many variables within fibromyalgia. Work with a qualified health professional and always start with what I call the LED (Lowest Effective Dose). This is when using powders over capsules can be helpful in controlling dosages, and often more cost effective.